In mid-2006 Warner Bros. announced that they had launched a new Direct-to-DVD Animation division that would be producing a series of DC Universe projects. EARTH IMPERILED, VILLAINY REIGNS, HEROES HUNTED - PREPARE TO ROOT FOR THE BAD GUYS! The World's Greatest Super Heroes become America's most wanted criminals - and are hunted by friends and foes alike - in Superman/Batman: Public Enemies, the sixth entry in the popular DVD series of DC Universe Animated Original PG-13 Movies. A co-production of Warner Premiere, DC Comics and Warner Bros. Animation, the full-length animated film will be distributed by Warner Home Video on September 29, 2009. Superman/Batman: Public Enemies will be available as a Special Edition 2-disc version on DVD and Blu-Ray Hi-Def for US$24.98 (SRP) and US$29.99 (SRP), respectively, as well as single disc DVD for US$19.98 (SRP) and On Demand. Order due date for all versions is August 25, 2009. In the film, United States President Lex Luthor uses the oncoming trajectory of a Kryptonite asteroid to frame Superman and declare a $1 billion bounty on the heads of the Man of Steel and his "partner in crime," Batman. Heroes and villains alike launch a relentless pursuit of Superman and Batman, who must unite - and recruit help - to stave off the action-packed onslaught, stop the asteroid, and uncover Luthor's devious plot to take command of far more than North America. Promotional Video Trailer: Quicktime file. Sneak Peek Video Clip: Hosted on YouTube. "Lex is President" Video Clip: Hosted on Amazon.com. "Lex Speech Reaction" Video Clip: 13.7mb Quicktime file. "Superman vs. Metallo" Video Clip: Hosted on MTV.com. "Rooftop Fight" Video Clip: Hosted on YouTube. "Superman and Batman Battle Villains" Video Clip: 16mb Quicktime file. The Blackest Night: Inside the DC Comics Event: Behind-the-scenes of BLACKEST NIGHT, the epic�DC Super Hero event in which the dead shall rise. A Test of Minds: Superman and Batman featurette with Jeph Loeb, giving viewers a fresh and revitalized look at the team-up of Superman and Batman working together despite their often competitive and challenging relationship. "Dinner with DC: With Special Guest Kevin Conroy": Reprising his role from Batman: The Animated Series, Kevin Conroy joins the crew for dinner to discuss their creative approach and what the Superman/Batman team-up means. The evening will be hosted by Voice Director Andrea Romano, Producer Bruce Timm and DC's Gregory Noveck. Extended Sneak Peak at Next DCU Film. 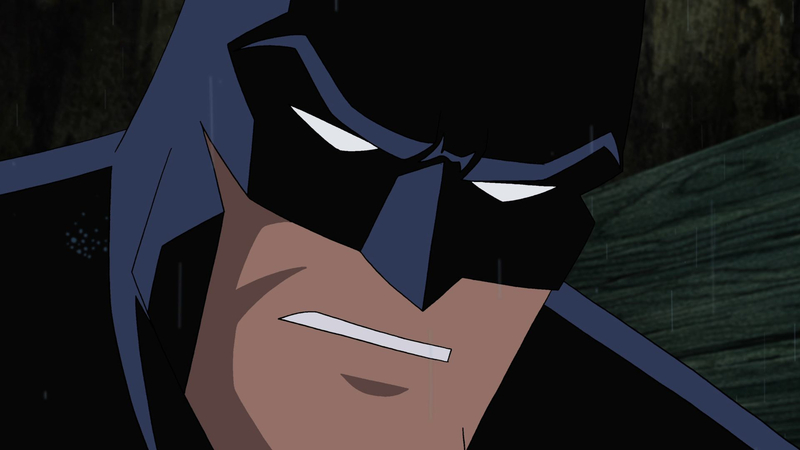 Two Episodes of Justice League Unlimited hand-picked by animation legend Bruce Timm. 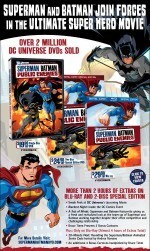 Superman/Batman: Public Enemies Blu-Ray versions will have more than three-and-a-half hours of bonus materials, including all the great extras from the 2-disc Special Edition as well as two additional episodes of Justice League Unlimited and two episodes from Justice League, both personally selected by fan-favorite Bruce Timm. "Warner Premiere is excited to continue this successful partnership with DC Comics, Warner Bros. Animation and Warner Home Video to present feature-length PG-13 animated original films with the filmmaking and celebrity voice starpower of Superman/Batman: Public Enemies," said Matt Bierman, Senior Vice President Production, Warner Premiere. "Based on the past success of Superman/Doomsday and Batman: Gotham Knight, we know the pairing of the Man of Steel and the Dark Knight - pitted against both their DC Super Hero colleagues and the entire rogue's gallery of DC villains - will offer fans the level of entertainment normally reserved for the big, summer blockbuster films," said Amit Desai, WHV Vice President of Family, Animation & Partner Brands. 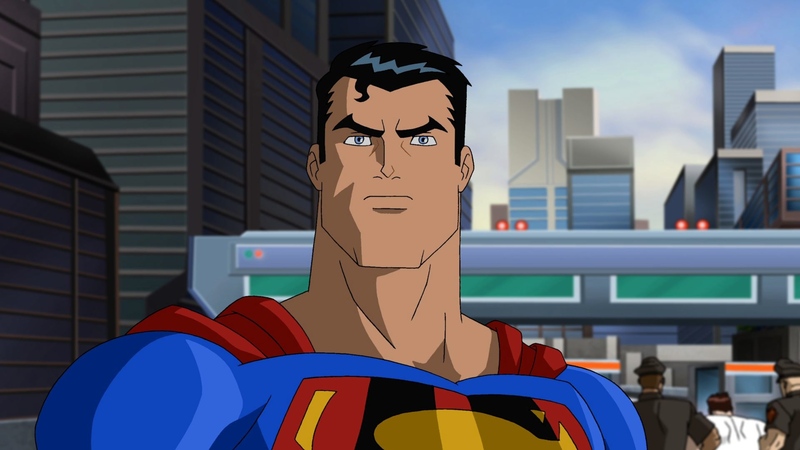 "This is the ultimate film for DC animation lovers featuring not only the cornerstone characters of comic book and Saturday morning heroes, but also returns the seminal voices of those characters - Tim Daly, Kevin Conroy and Clancy Brown - in a story that explores the Superman/Batman dynamic and allows Lex Luthor to shine in ultimate villainy," said Gregory Noveck, Senior VP Creative Affairs, DC Comics. Runtimes: Disc 1 - Estimated 75 min.